The photography class I am teaching at the Girl Hub is now in its third week, and I feel like we are really starting to tap into something in each girl. There is nothing as exciting as when an image comes up on the screen that they have made, and it speaks to me, and I see that they are beginning to find their voice and enjoying the journey of seeing what a photograph can be. We had to get through some of the technical stuff this past week and since I remember it was hard to understand exposure, shutter speed, and aperture when I was learning it in my own language, I know it would not be easy material for them. My amazing friend and translator Dida has helped a lot but there have been times that there is simply no corresponding word in Kinyarwanda, so we just try to find a creative way to explain things, and I do a lot of diagrams and drawings as well. Yesterday I tried one more way to explain the relationship between these important photographic elements. I drew a diagram on the board illustrating water (for the light) coming out of faucet, and how if the water is coming out through a small hole, you have to leave the faucet on longer (longer shutter speed) to get the same amount of water than if you had a big hold (aperture) in the faucet. My drawings leave a lot to be desired, but all of a sudden I got these wide eyes, smiles, and nods, as it was starting to make sense to them. Which is good, because we have more fun stuff to move onto. Tomorrow I will be teaching them how to use studio lights, with the help of Martin, a Ugandan photographer working for the Girl Hub. I paired them up to take portraits of each, and we spent much of yesterday looking at portraiture and talking about it. It’s really fun to show them portraits ranging from Mary Ellen Mark, to Richard Avedon and see what they think of them. 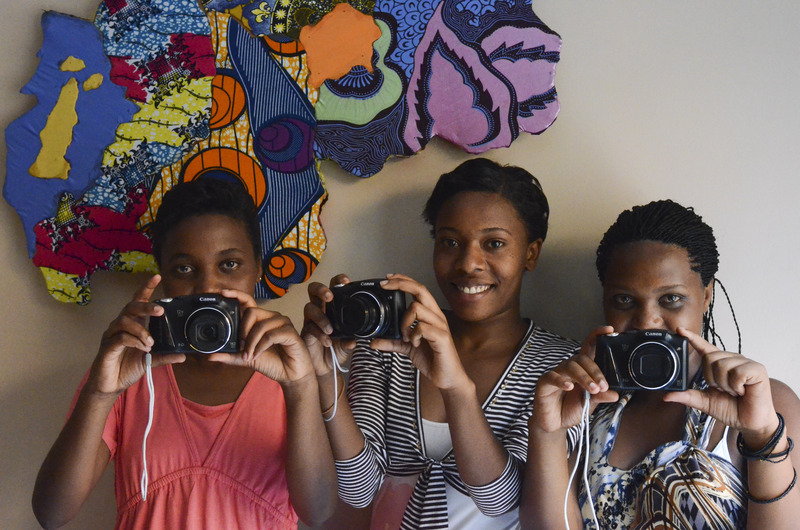 The girls are truly a blank canvas when it comes to the visual arts, having seen very little photography or other contemporary art, especially given that Rwanda has never been a country that focused on art. That is starting to change now, and we are hoping these girls will be part of the artistic growth of this younger generation. The younger girls who are around 14, are more playful about it all, and tend to giggle a lot in class, which brings a real joyfulness to our learning. Whereas the older girls who are 20 and 21 seem to be looking at this as a valuable skill and possible career, because they are at the point of needing opportunities in order to be able to achieve their goals of a better life for themselves and their families. Next week we move into doing a mock assignment for the magazine, which will be really exciting because we want these girls to be able to shoot the content for Ni Nyampinga, so that along with the girls who are already writing for the magazine, they can help make it truly a publication that is by girls and for girls. Today I had the privilege of going to the home of one of my students, Diane, to create images about her life as a girl in Rwanda. As is often the case, I could not have predicted the experience that awaited me and the emotions that the day would bring to all us, myself and my Rwandan friend and translator Dida, as well as Diane. I left with a greater understanding of their lives, and about how people sometimes have to bear unimaginable things, as well as how strong the human spirit can be as it tries to endure and even thrive. I was overwhelmed by the hospitality and love that Diane and her mother showed me, giving me hugs and big smiles, as they welcomed me to their home. She told us that some of the other girls in our class asked how she could have me over to her house, wasn’t she embarrassed by being poor? 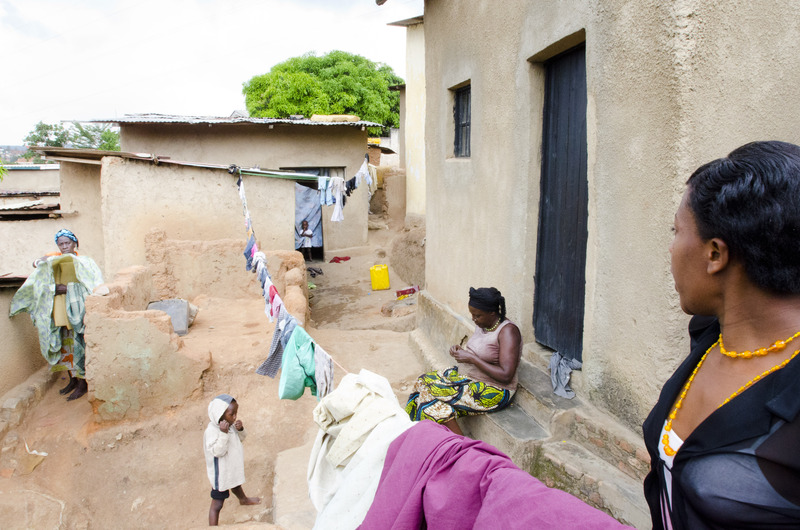 Not at all she told them, she was proud of her house, her mother and their life. Her pride was evident as she eagerly showed me around and I saw the neatness and the care with which they treat their home. 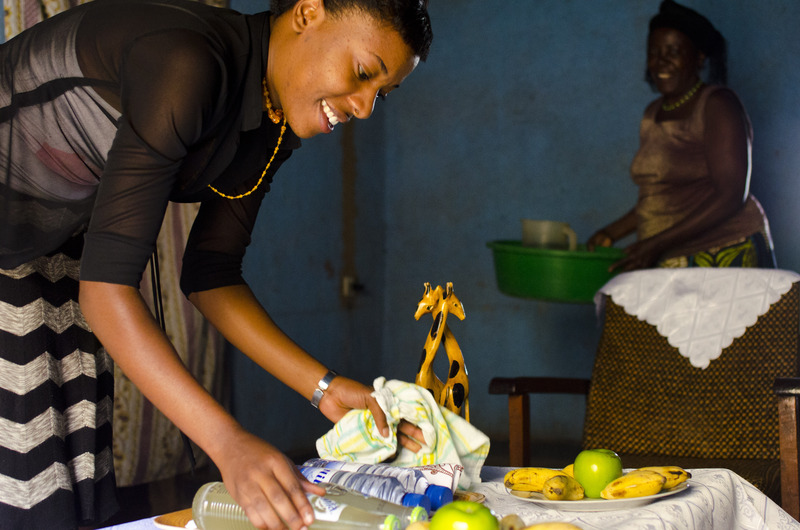 It is a simple house, Diane and her mother share a bed, but as with many things in Kigali it is striking how clean and organized her house was. Their beds are made to almost military standards (whereas I can’t remember the last time I made mine). They served us a snack of fresh fruit, apples and these tiny bananas that they have here, that are much more flavorful than the ones in the US. Diane, ever observant, said she had noticed me with une pomme at class one day, an apple, and so had gotten some for me. 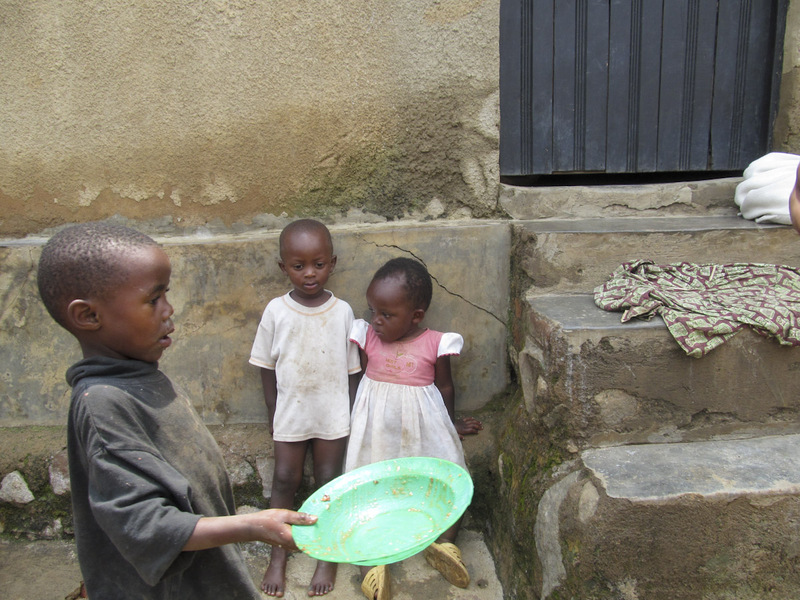 Her mother brought us a basin of water, some soap and towels to wash our hands before we ate. Dida explained that travelers in Rwanda, anyone who was making their way across the country, used to be able to stop into any home and be offered a place to stay and food to eat. That has changed a lot since 1994, but they still treat their guests with enormous generosity and kindness. As we walked around the house, talking about some of their daily routine, I was taking pictures, and talk turned to how many brothers and sisters both girls had. I knew instantly from the look at Dida’s face that this was not an easy answer for her. After a deep breath and a pause, she went on to tell me that there had been 10 siblings in her family but that she had lost 7 of them along with her mother and father in the Genocide. While this should not have surprised me, I was unprepared for hearing that my friend had personally been through such pain and horror. What I had until then only read about, and had tried not to focus on since coming here so that I could experience the country for what it is now, was hitting me with such force that I felt it was hard to breathe and could only reach out and hug her. It’s okay she said, we are used to this. But it’s not okay, it was not okay to me what she had to endure as a six-year-old girl, and ever since. I liked both Dida and Diane as soon as I met them, they are in their early 20’s, and give off an infectious positive energy, curiosity and confidence. As we are working towards teaching them to be photographers, and looking forward to the opportunities this could bring them, I had not yet allowed myself to think too much about the past they carried with them. There are moments on the street or during an interaction with someone at the market, especially if a person is old enough that you know they were around in 1994, that you are struck by wondering what their story is and what burdens they carry with them from the Genocide. You of course don’t want to pry with those you don’t know well and honestly it’s hard to think about it too much without feeling weighed down by the sadness of it, so you move on. I think that many Rwandans are struggling to figure out how to bear such pain and heartache, yet try to move forward as they work hard to help their country heal. They are asked to remember what happened over and over, on national anniversaries like the one coming up in April, in part to help make sure it never happens again. Yet they are trying to move beyond it as well to find a way forward, as they are working at a reconciliation, a peace with something that most of us could never imagine having to make peace with. You feel sometimes like they are giving everything they have, every last bit of energy, trying to will themselves and their county forward to a better place. As you can imagine, it is not an easy path. Every day they choose to be optimistic, they fight to push past any depression or despair, but it isn’t always enough. 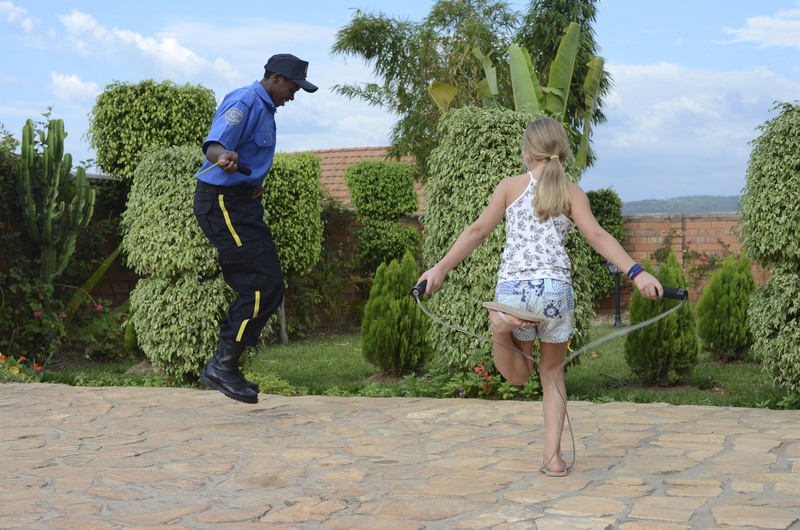 Yet they have fierce determination, and I can tell you that if these two girls are any indication of the people who will be determining Rwanda’s future, the country has great reason to have hope. I am in awe of their strength, work ethic, bravery and most of all the capacity they still have for joy and laughter . The three of us sat on Diane’s bed for hours, like any girls would do, talking and laughing about life. She sang us a song she had written, and then proudly showed me her school books, as they both talked about how much school means to them. It is a chance to make a better life for themselves and their families and to try to make a difference in their country. Only a few references were made to the genocide or to moments that they feel overwhelmed or discouraged in their lives. Mostly it was about their optimism and how hard they wanted to work to create opportunities in their lives, to help other people, and to be part of Rwanda’s progress forward. Eventually Diane also wanted to talk to me about her family, to let me that she had lost several of her siblings as well. It was another blow to absorb, and I realized that as awful as it was, I needed to get used to the idea that this was a common experience. I asked if her mother, who was sitting and singing in the other room, ever talked about that, the loss of her children in such a way. As a mother myself that really is beyond anything my mind can grasp. “No”, she said, they don’t really talk about it. It is something that everyone holds in their own space and in their own way, and some people do get to a point where they just breakdown from it. As we laid on her bed talking, Dida translated from Kinyarwanda to English and back again, sometimes with a little French thrown in. I was still trying to absorb what this must be like for them. The experience of the genocide that so many carry with them, is something I know I cannot, and should not ignore, but nor do I want to dwell on it too much either. I will find my own way to include the reality of it in my experience here while still choosing most of the time to focus on the present and the future, on the amazing love and hope that I am seeing everyday on the faces of people I meet in Rwanda. I know that is also what Rwandans want, to be known for the beautiful country that they are, not just for one dark period in their history. This day has without a doubt stirred something profound within me, as I have come to know these amazing young women who are forging ahead with through so much difficulty, yet with so much spirit. I was incredibly moved to be embraced by them in such a trusting way. We reflected on how special the afternoon had been for all of us, Diane telling us she loved us and asking Dida and I if she could come to us for advice. What an honor to even be asked to offer wisdom to someone who probably could teach me far more about life. We made an important connection with each other, a sisterhood, and to me that is what it is all about. Women supporting other women, and younger girls, to be sure they have opportunities to grow and succeed, and to know that they are not alone, that someone cares. After all, isn’t that is what we all want, no matter where we are from. I am very much looking forward to getting to spend more time with them in the months ahead and to taking Diane up on her offer to come back for a traditional Rwandan dinner. We had our first class on Monday, and while the younger girls didn’t make it because they were still working out permission from their parents, the older girls came and we had a very enthusiastic start. The rest of the girls will be there today for the second class, so then we will have our entire group. I have a Kinyarwanda translator and so far we seem to be getting meanings very well back and forth. Some photography terms have been tricky for her to translate, but overall I think it’s working very well. The girls don’t speak as much French as I had anticipated, so I am not able to use my French skills, what they are. We spent most of class looking at photographs, from books that I brought from home, and on websites, including those of my friend Toni Greaves (you know I love your work!). I included work from several of my teachers at ICP who had an impact on me, including Andrew Lichtenstein, Andre Lambertson, and Lori Grinker. I chose a number of women photographers, but tried to mix it up too. I’m always looking for photography to show them, so to all my photographer friends, if you have anyone whose work you think they should see, please send me your thoughts. In particular work about girls, and by girls, which I haven’t found as much of as I would have liked. At the end of class we gave them their cameras, and they got very excited and started taking pictures of each other. I would like to give a big Thank You to Jon at Pro Photo in Portland who is helping to support this project and who helped us to get cameras for the girls to learn on. The girls getting their cameras – thanks Pro Photo! Today at class things will get really exciting when we get to see what they shot for their first assignment. I’m looking forward to hearing about what stories they have to tell and honored to be a part of that process. 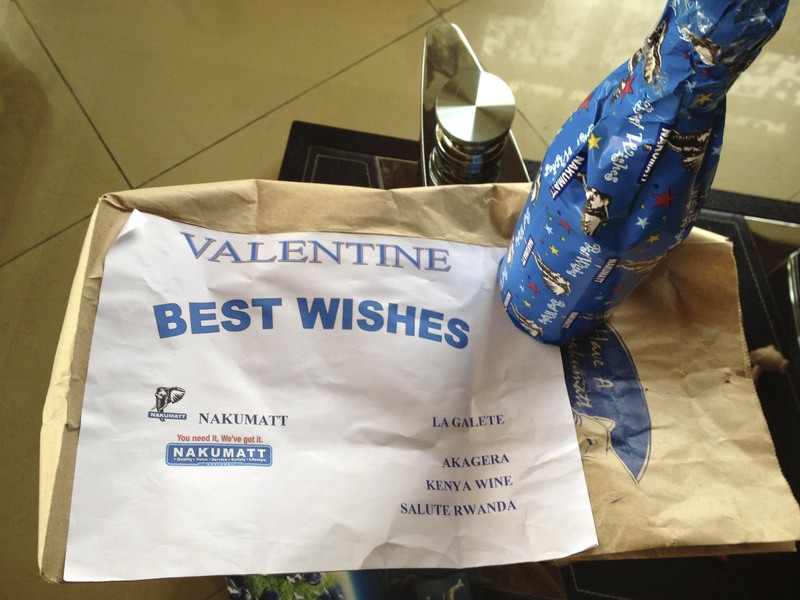 On a fun side note, I was recently at the grocery store here, Nakumatt, when I was told my receipt showed I had won a prize. Lots of people ran around, getting this gift, getting a camera, and they took a picture of me with workers from the store giving me my wrapped present, in honor of Valentine’s Day, which apparently is pretty big here. I relayed this story to a friend who lives here and she said winning prizes is a really big deal to them, something I could tell by all the fuss they made about it. I have to try to get my hands on the picture they took, I’m told it is probably up in the store so I will have to go see. This is the wine they gave me. I am very excited to be going to the local arts center today to meet some of the girls who want to take the photography class. It will be hard to decide who to choose but we want to make sure we find girls who are committed to doing the two classes each week and will have the interest to carry forward to take photographs for Ni Nyampinga, to tell their stories of life as a girl in Rwanda, and maybe even go on to have a career in photography. That is our hope. 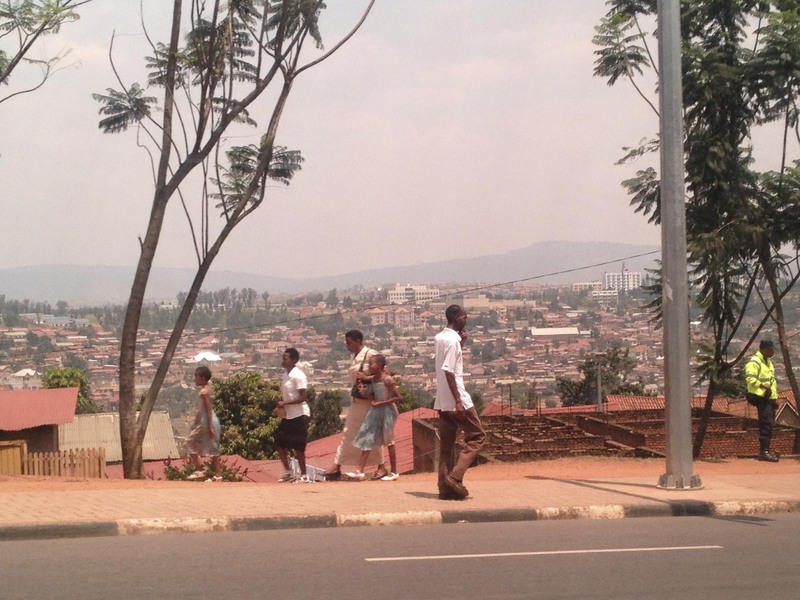 I was shocked by how few photographers there are in Kigali. It’s not even on the radar for girls here, and so the Girl Hub was very excited about the opportunity to give them a new means of self-expression as well as new career possibilities. This may just be the first step for some of them. 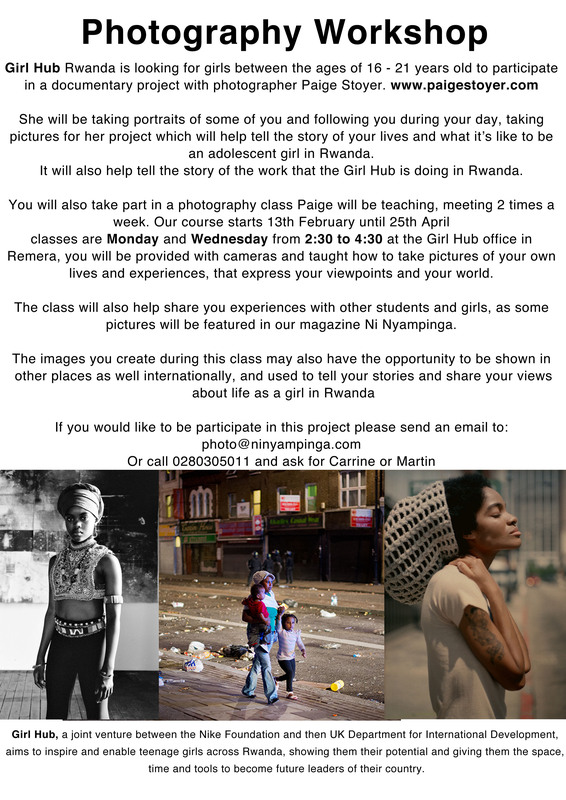 The Girl Hub sent this flyer out to gathering places for girls so that they could contact us if they were interested in the class. It took moving to Africa to get me to finally start a blog, since I want to be able to share this amazing experience with everyone. It also gives me another way to inform people about what is going on with my photography. So first I will let everyone know that if you are in Portland in February, to go check out the juried show “Black and White” at Newspace. I have an image in the show from my series, “A labor of love”. Now, to where I find myself right now, which is in Kigali, Rwanda with my husband and two kids. We have been here just over a week now, and most of that time was spent getting adjusted to the time difference, getting our house in working order (including finding a viable way to do laundry), and getting the kids started in their new school. Lucky for me the girls are very adaptable and brave, and after their first nervous morning, now jump out of the car and run off to their new friends. And so a certain routine has started, including homework each night, but there are some twists and challenges in how to get everyday things done. We are also getting used to things like having a 24 hour guard at our house who we can hear walking around all night. When we were buying some basics for our house, we were told they were out of towels but might have some next month. Thankfully we were helped out by some friends at a local hotel. At this point our crew was in bad need of some showers. 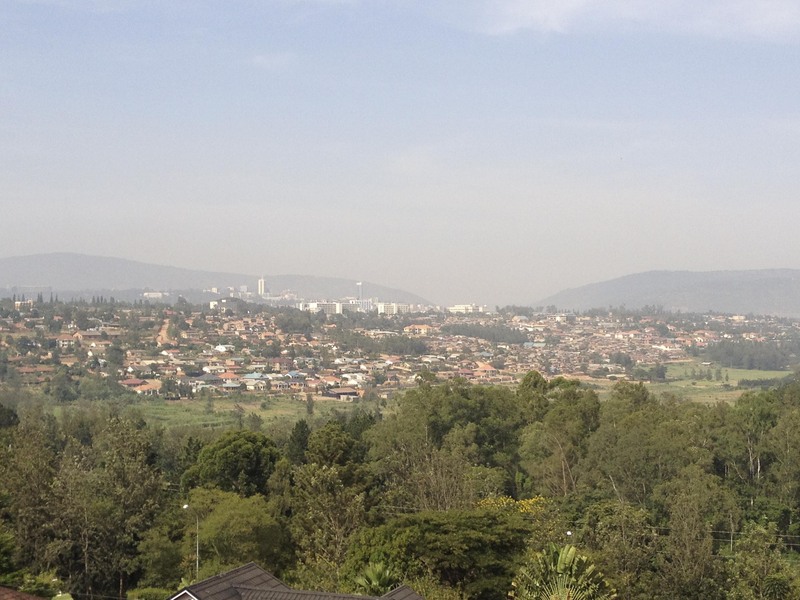 As my daughter says, “in Rwanda, everyday I sweat.” Really I find it to be the perfect weather here, warm and sunny (but not too hot) during the days, and just a bit cooler at night. As to why we are here, a brief explanation for any of you that don’t know the background. My husband Dean works for the Nike Foundation, who in partnership with the UK government’s Department of International Development (DFID), run the Girl Hub here in Rwanda. For the next few months Dean will be the interim head of the country office here for Girl Hub, in addition to his other job as the Global Director of Communications at the Nike Foundation. 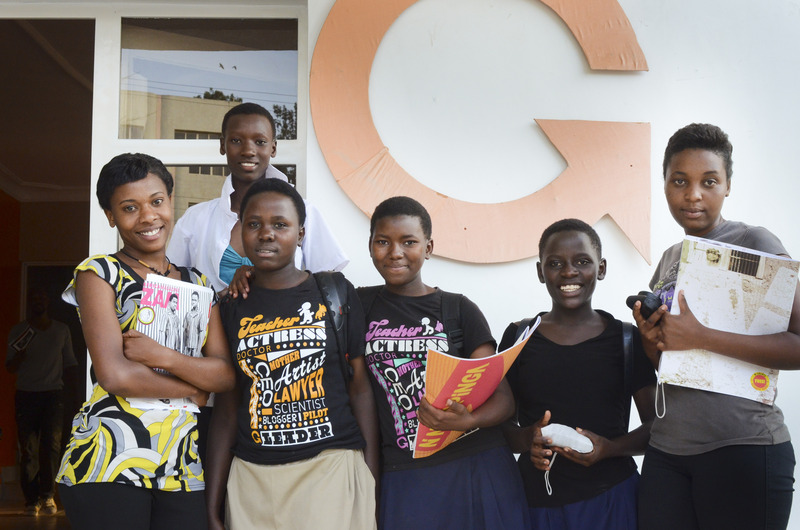 In short, The Girl Hub runs programs that carry out the mission of the Girl Effect movement, which is the idea that adolescent girls are at a critical juncture in their lives, and if given knowledge and opportunity, can help break the cycle of poverty for themselves, their families, their communities, and their country. Here in Rwanda that it taking several forms, one of which is creating a means by which girls can communicate and express themselves, through a radio show run by some of the girls, and with a magazine called, Ni Nyampinga. 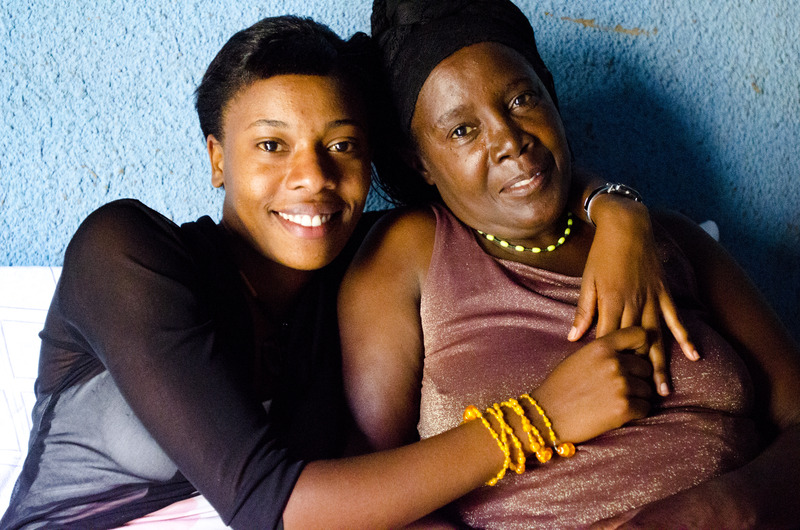 In the local language of Kinyarwanda, Nyampinga means a beautiful young girl who makes the right decisions; she is beautiful on the inside and out, is confident, and respects herself and others. The Girls Effect explains that there are 600 million adolescent girls living in poverty in the developing world, and by giving one of these girls a chance, you start the girl effect. When girls have safe places to meet, education, legal protection, health care, and access to training and job skills, they can thrive. And if they thrive, everyone around them thrives, too. Our first week here was especially busy also because Dean was preparing for a visit from Nike Brand President Charlie Denson, to see firsthand the work that the Nike Foundation was doing in Rwanda, and to help celebrate the launch of the second issue of Ni Nyampinga. 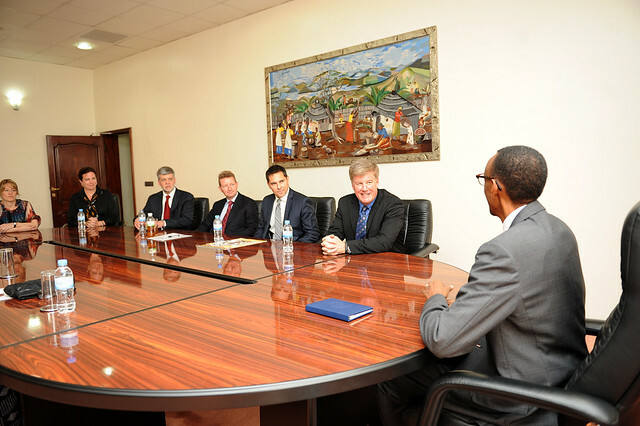 They also met with the President of Rwanda, Paul Kagame, who is a firm believer in the importance of giving girls opportunities and whose administration has been working closely with the Girl Hub to support their mission. 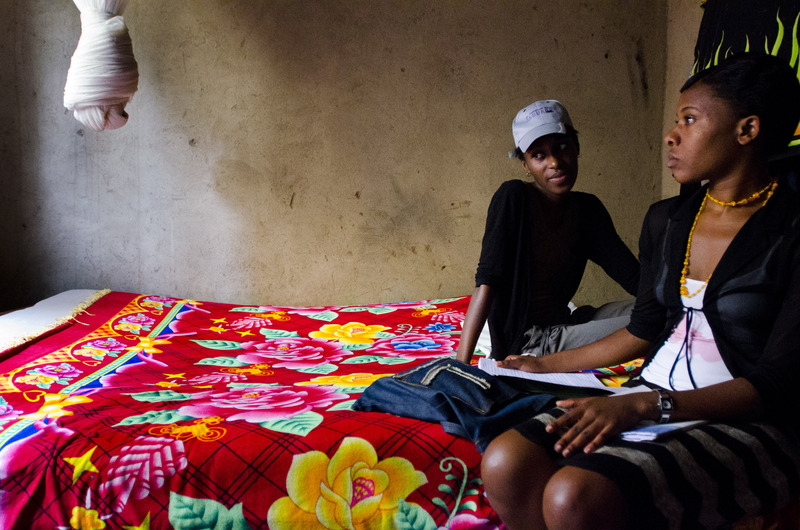 Rwanda is working hard to institute their own programs to help mobilize the Girl Effect. I have been an enormous fan of the work the Foundation does for a number of years, before Dean came over from the brand side at Nike. And I have been working with the Foundation to find the right opportunity for me to go document one of the Girl Effect programs. 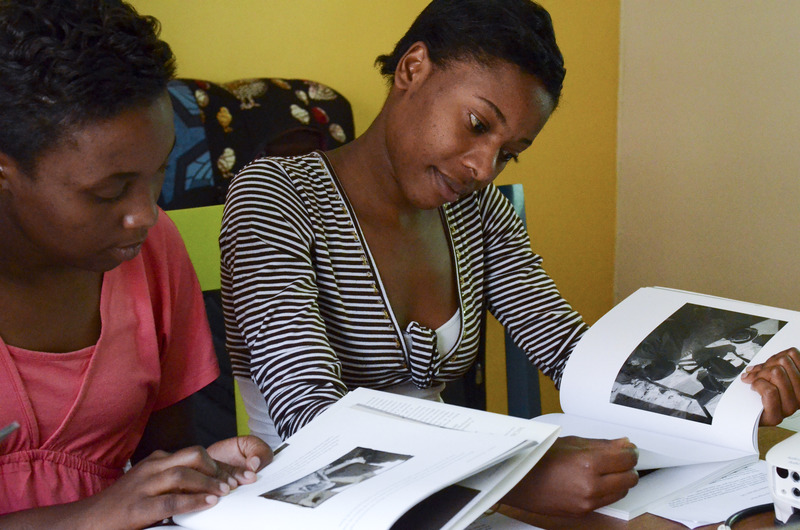 It was also my dream to be able to teach a photography class for some girls as part of that trip, much like I did for my project, The Long Journey. 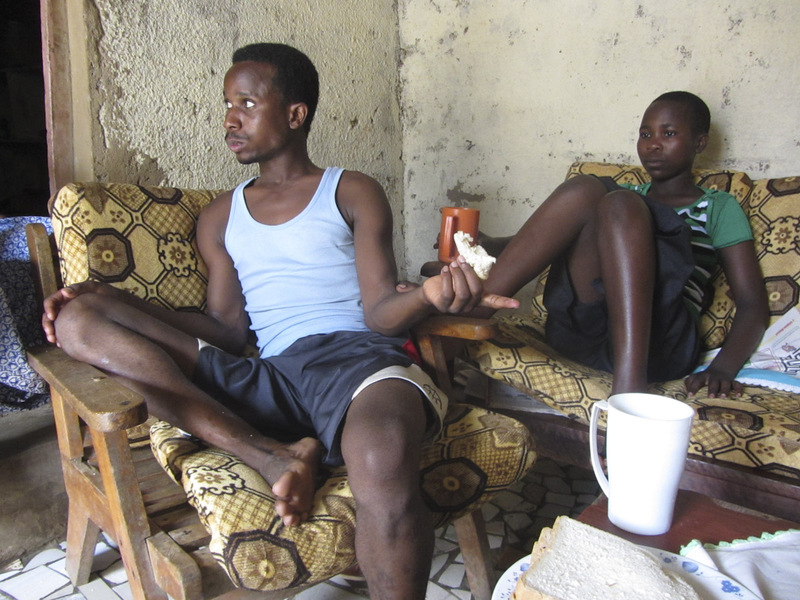 The opportunity for our family to come to Rwanda provided the ideal situation to move forward with this plan. It also gave me a much longer time frame to work than I would have had if I had come on my own, as I couldn’t see being away from my children for more than 2-3 weeks at the most. There are a lot of exciting things happening around my photography and the class, and I look forward to sharing all of this, as well as my family’s adventures, as our time in Rwanda unfolds. So now you know why we are here, and I look forward to what the next few months will bring for us, what we will learn, and hopefully what we have to give and share with the people of Rwanda as well. As we go I will share that journey on this blog. You can also follow our kids’ blog, as I know their school and many of their friends are doing. For more updates, you can also follow me on twitter.